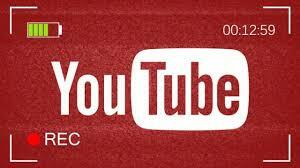 Do you publish videos on YouTube? Did you know that as the number of subscribers to your YouTube channel reaches certain levels, there are extra benefits you have available to you? Production Access -YouTube Space production benefits, including premium soundstage access, hosting your own events and more. Enter NextUp – Eligible creators can enter the YouTube NextUp Contest. Winners get help with new equipment and a spot at a week-long creator camp at their nearest YouTube Space. Creator Awards – Silver Creator Award (1 million subscribers, a Gold Creator Award, 10 million subscribers, a glittering Diamond Creator Award). The only reason I’m aware of all this is that I exceeded 1,000 subscribers somewhat recently, which I have to believe is based on some Russian troll farm trying to undermine U.S. sovereignty or something. I vaguely remember when singer/songwriter Tom Goss was nearing the 10,000 subscriber threshold, he indicated he’d have superpowers and then he started producing extremely professional music videos. 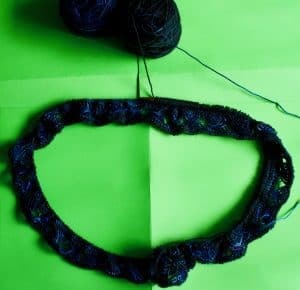 So, if you want to see QueerJoe start doing such appealing “professional” knitting videos, start getting your friends to subscribe to my channel…then again, I might require a bit of cosmetic surgery too, so we may need a GoFundMe page as well. 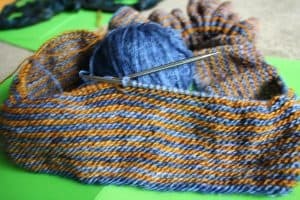 Work continues on the two-color garter stole. It’s looking better and better as I continue (it doesn’t photograph very well, to be honest), and I think this one will sell quickly at the show. 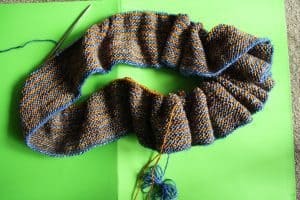 I also started a new Knitted Cross Stitch Scarf. 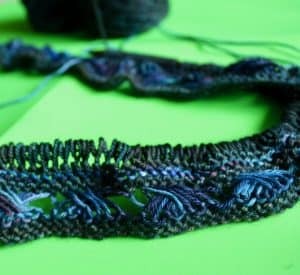 This one is using two very dark and broody yarns that I think might be very popular too.